Category Archives for "heat stroke"
As the temperature beings to rise, athletes must be aware of the effects of exercising in the heat on the body and on performance. Heat loss during exercise can occur through four different processes: evaporation, radiation, conduction, and convection. As the body’s core temperature rises, blood is transported to the periphery for cooling. This leads to a deficit in the body’s central fluid, which results in a smaller stroke volume (volume of blood pumped from the heart) and an increased heart rate for a given exercise intensity. Splanchnic vasoconstriction, a reduction in blood flow to the internal organs, especially to the abdomen, attempts to compensate for the peripheral outflow. However, this may lead to gastrointestinal and kidney issues. There are various heat illnesses that an athlete may be susceptible to. 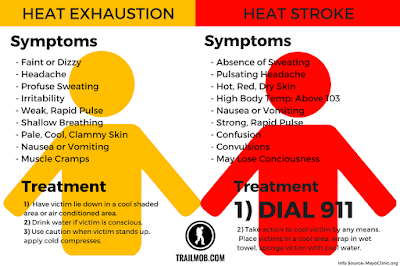 Exertional heat stroke (EHS) occurs at a body temperature of greater than 104°F (40°C) immediately post collapse and central nervous dysfunction. Symptoms include: headache, confusion, dehydration/muscle cramps, gastrointestinal upset, profuse sweating, rapid pulse, low blood pressure, and quick breathing. To treat EHS, immediately remove equipment and excess clothing. Cool the athlete as quickly as possible within 30 minutes via whole body ice water immersion. However, if this method is unavailable, move to a cool area and rotate cold wet towels. Check for airway, breathing, circulation and continue to monitor vital signs until paramedics arrive. Cease cooling when body temperature reaches approximately 101-102°F (38.2-38.9°C). 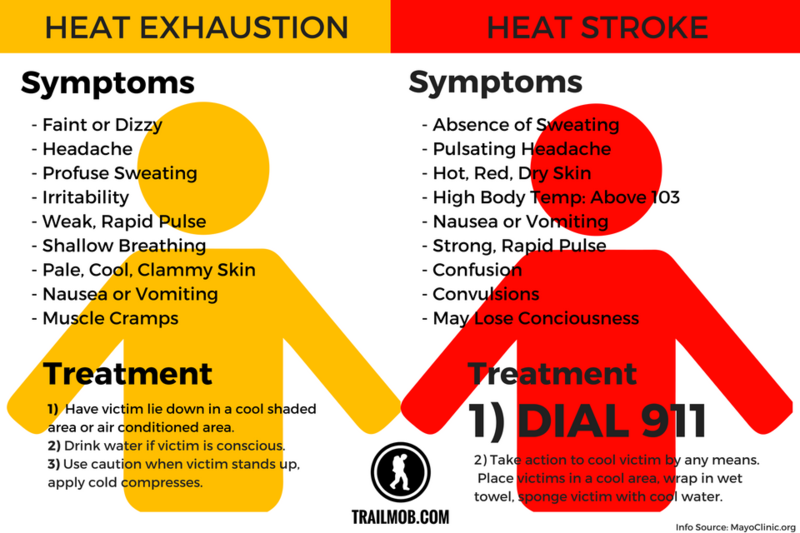 Heat exhaustion is another heat illness commonly experienced by athletes and occurs due to cardiovascular insufficiency and energy depletion that may or may not be associated with physical collapse. Individuals with a body mass index of greater than 27 or exercising at temperatures greater than 33°C are at a higher risk of experiencing heat exhaustion. Symptoms include: fatigue, nausea, weakness, hyperventilation, core body temperature between 96.8-104°F (36-40°C), and heavy sweating. Treatmentbegins with moving the athlete to a cool area and removing equipment or excess clothing. It is important to elevate the legs to promote venous return. Attempt to cool the individual with ice water or fans and rehydrate. Heat cramps are painful involuntary cramping that often occurs in the legs, arms, or abdomen. Athletes may experience these abnormal muscle contractions if they are prone to excessive sweating, not acclimated to the heat, have heavy clothing or equipment, exercising for prolonged periods without proper hydration, or experiencing muscular fatigue. Similar to the previously mentioned heat illnesses, treatment is to move the athlete to a shaded area, rehydrate with cold water, and stretch or massage the cramped muscle in its fully stretched position. Provide foods that are high in salt content to replenish lost electrolytes from sweating. The best predictor of recovery is early recognition and rapid treatment. Enforce a gradual progression of exercise and acclimation to the heat. 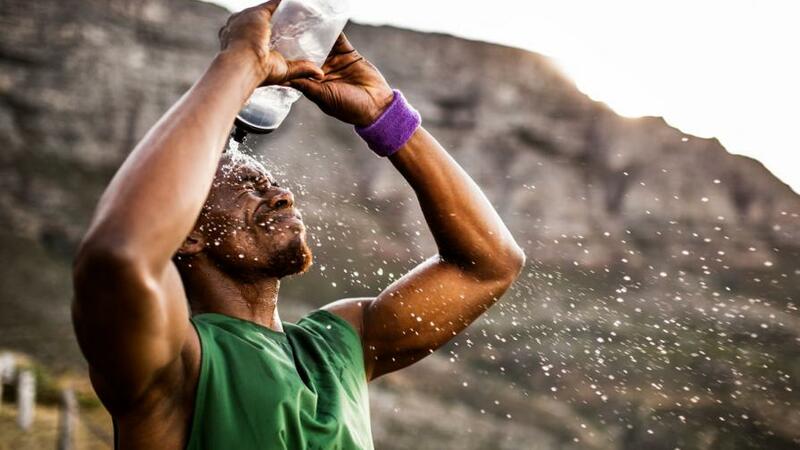 Educate athletes on how to recognize heat illnesses and be aware of when to cease activity. Hydrate and rest appropriately throughout training.